The amount of water flow should be taken into consideration with every reef tank. The average aquarist doesn’t have enough water movement, which can cause increase nitrates and algae growth. To determine if your fish tank has enough flow, start by adding up the water flow created by powerheads, return pumps, power filters, and canister filters in the display tank. Flow is usually measured in gallons per hour. Don’t count flow that doesn’t directly impact water movement in the display tank, this includes equipment located in the sump, like protein skimmers and media reactors. Now divide the total GPH by your display tank’s water volume. For example, 1500GPH of flow through a 75 gallon aquarium is 20 times turnover per hour. Most fish only aquariums should turnover 10 to 20 times per hour to keep detritus from settling. Aquarists keeping SPS coral or running low nutrient systems may prefer flow rates of 40 to 100 times turnover. Whatever system you run, remember to take substrate into consideration. Finer substrates like Live Sand and Aragonite can create an aquarium sand storm if powerheads are not properly positioned. Although flow rate is important, powerhead positioning is even more crucial. To maximize water turbulence, position the powerheads near the surface of the water. If the substrate is being blown around, try lowering the powerhead or redirecting the flow against an aquarium wall. If after these adjustments you still feel like your aquarium needs more flow, consider adding another powerhead. For years, the industry standard has been the Maxi-Jet 1200. This durable pump can be used with a wavemaker, is easy to set up and should provide years of trouble free performance. This powerhead creates 295GPH of flow and can be easily upgraded to produce up to 2100GPH of flow with the of Sure Flow 1600 Maxi-Jet Upgrade Kit. This affordable kit is compatible with all Maxi-Jet models and contains a low flow and high flow propeller. 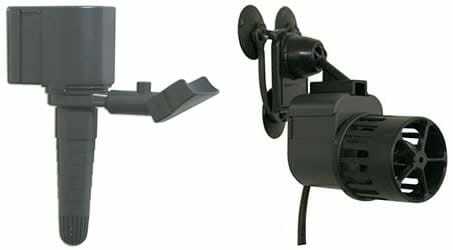 Using an upgrade kit is an affordable way to increase water flow on powerheads you may already own. Please note that upgraded Maxi-Jets should not be used on a wavemaker. Another option is to purchase a stream pump. These powerheads create a wide stream, rather than a water jet. This is beneficial to corals and will also reduce dead spots. These pumps may be positioned in the same way as other powerheads to maximize flow. Popular brands are Hydor Koralia and Tunze. After the addition of a new powerhead, it is typical for the fish to be blown around and the corals to show signs of stress. Most of the fish will adapt to the new flow, but you may need to reposition some of the corals. Your water may also appear cloudy as the new powerhead blows detritus off of Live Rock, but should clear as the debris is removed by the filter. The new powerhead shouldn’t rip the flesh off of corals or create a sand storm, if this occurs, reposition the powerhead.